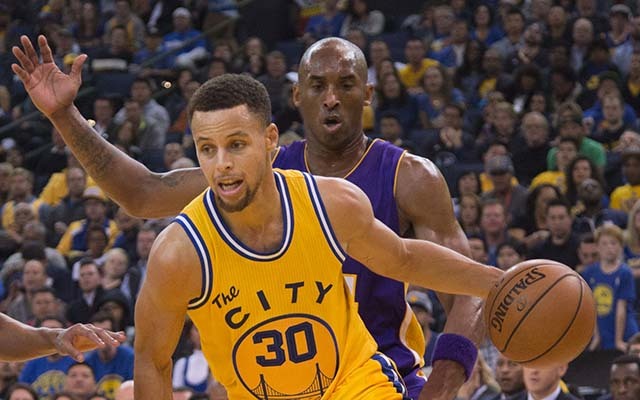 NBA 360: Just how good is that Warriors smallball lineup? The Warriors' smallball continues to dominate, the Magic give an early gift worth giving, the Raptors have greatness on Drake night, and the Cavs are just hurt. All that and more in our notes roundup. With the NBA season in full swing, we take a look at some of the notable developments from around the league -- many of which aren't being talked about enough -- including stats, quotes, videos, and more in our weekly roundup of observations. Some call it the "Death" lineup, others call it the "Nuclear" lineup. It's even been called the "Velociraptor" lineup. Either way, the Warriors' smallball lineup of Stephen Curry, Klay Thompson, Andre Iguodala, Harrison Barnes, and Draymond Green now has an offensive efficiency of 154.7 and a defensive efficiency of 84.8 for a net rating of 69.9 points per 100 possessions. That's a simply absurd figure. I've taken to asking every NBA person I know, from scouts to execs to media to fans, how do you counter it? What do you do? A few days prior to the Thunder rolling into Salt Lake City, getting Kevin Durant back, and demolishing a pretty good Jazz defense, the Thunder were troubleshooting a way to get by without the 2014 NBA MVP. At one point in a loss to the Pelicans, who were dealing with their own injuries, Thunder guard Dion Waiters had a breakaway chance in the first quarter. He hilariously missed a dunk attempt/layup opportunity, which dropped him to more misses on layups this season than makes at the time. He wasn't going to do that again, especially when he had several chances at dunks or layups against the Jazz's defense. Three different times in that game, Waiters dunked the ball emphatically. One such dunk even led Waiters to do a "raise the roof" celebration, which our records show hasn't been done since 1998. It's also possible he was just trying a new way of calling for the ball and wasn't actually raising an imaginary roof. Cleveland's locker room was not a particularly pleasant place to be following the loss in Toronto. Media members were kept waiting awhile for the door to open, and when it did, LeBron James gave curt, dismissive responses to most of the questions asked of him. James wore an intense look on his face even after his scrum ended. Tristan Thompson repeatedly called the team soft, and said he and the rest of the bigs were to blame. When ESPN's Dave McMenamin and the Cleveland Plain Dealer's Chris Haynes reported that James and veteran James Jones called everybody out, I wasn't surprised. The Mavericks got a rather insane idea in their head vs. the Grizzlies this week. Down 121 in the fourth quartter, they went to Hack-A-Tony, intentionally fouling Tony Allen. Of course, that plan doesn't work so great when it's a career 72 percent free throw shooter. This season, Allen's only shooting 59 percent from the stripe but that's still not good enough to gamble on it slowing down the Grizzlies. Allen went on to hit six of eight, and the Grizzlies' lead stretched to 15. Beyond the fact that Allen can hit free throws, and the fact that the Grizzlies' anemic offense would likely fare worse anyway, the Mavericks also didn't stick to it, which meant that they were just supplementing the Grizzlies' offense. By the time it was over, the lead was too big to come back from, and while the Mavericks did score seven points in that two-minute span, it wasn't enough. Baby races in basketball arenas has been all the rage. Between quarters or maybe even getting top billing during a halftime show, parents line up a few infants at the starting line on the court and as soon as the MC says to go, another parent a few yards away start calling for their baby. The crowd can really get behind it because of the adorable nature of watching these kids move along the hardwood floor. During the Oklahoma City Thunder-Utah Jazz game Monday night, the Vivint Smart Home Arena crowd in Salt Lake City saw quite the show in a night full of emoting. The baby race featured three crawling rugrats and only one of them truly embraced the competition. As two of the kids just kind of stayed at the starting line when the race began, the baby in the first position took off. He was crawling like a young Carl Lewis, bolting ahead of the competition in a way that made you feel like he's destined to be the next great Olympian. The crowd couldn't help but get behind this incredible effort. However, as the small child approached the finish line, he possibly buckled under the pressure. He was about a foot and a half away from winning the race when the roar of the crowd cheering him on was simply too much. He stopped right in his tracks with the camera zoomed in on his face. He leaned back on his legs under him and began sobbing. He cried for the entire crowd and the cheers immediately turned into "awwwww" sounds. The rest of the competition was nowhere near him. Byron Scott is trolling the world at this point. 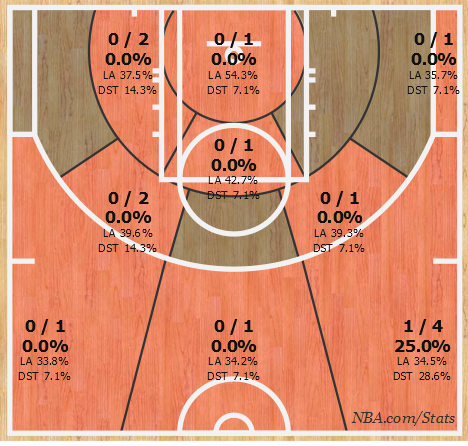 Here's Kobe Bryant's shot chart from the Los Angeles Lakers' humiliating loss to the Golden State Warriors Tuesday. 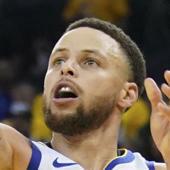 After the game, Scott reiterated that he has no concern over Bryant's shooting, and later said the would not consider for a moment benching their star veteran. Bryant said that his teammates had to help him more. Toronto is 3-0 on Drake Night, the team's annual celebration of its global ambassador. This time, Drake watched his Raptors upset the shorthanded Cavaliers while sitting next to his mom courtside. His mom was not in her seat in the second half, though, so she perhaps missed out on Kyle Lowry's offensive explosion. Before the game, Toronto general manager Masai Ujiri and Drake talked to the media from the "Hotline Bling" box the team had set up. Ujiri danced a little bit and raved about his Grammy-winning friend. The NBA community often does a lot to help the community during the holidays. It's work doesn't make headlines or get page views, but it's important work that actually makes a difference. I try and keep track of as many as possible, but this one from the Magic stood out among all the rest. U.S. Army Corporal Scott Owens and his family were presented the keys to a newly remodeled mortgage-free home in Winter Haven, Florida during theMagic’s game on Wednesday. On hand to reward the Owens’ were representatives from Building Homes for Heroes, Chase and the Magic. The family of five was also surprised with a few other gifts during the ceremony. They received a $1,000 check to help with holiday shopping, personalizedMagic jerseys, Disney Park passes and other gadgets and goodies for the three kids to enjoy. I asked Tyson Chandler about the Suns and what they needed to improve. He mentioned weakside communication, a pretty standard answer. But when I asked him why the youngsters on Phoenix struggled with that, his answer was pretty interesting. "Being young, it's confidence and understanding the game. You tend to be quiet because you're not confident in what you're saying. It's about understanding what you're trying to accomplish." In the last four games, the Sixers have held a lead in the fourth quarter at some point. They have a net rating of minus-15.6 points per 100 possessions in those games. Basically, in the last five minutes, they melt like plastic toy men under a magnifying glass in the sun. Much of this has been the result of their woeful backcourt. The Sixers' guard situation is dire, with Tony Wroten and Kendall Marshall still out, plus, the fact that Tony Wroten and Kendall Marshall are considered upgrades on what they have. The Sixers can't feed the big men because Nerlens Noel has been disastrous offensively this season and Jahlil Okafor's a rookie. Even if Okafor were able to carry them home, which would be a better option with his ability to command double teams and thereby create open looks on the perimeter, the Sixers' guards can't get the ball to him anyway.